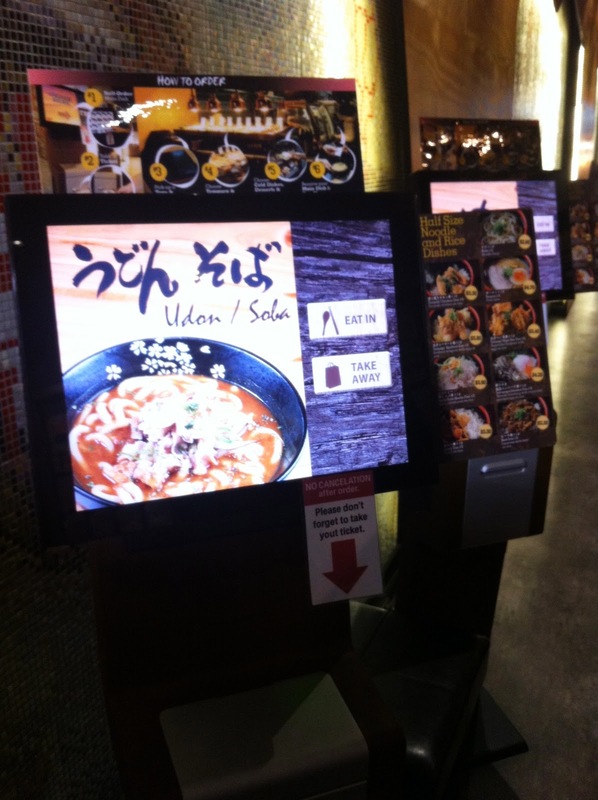 The formula: contemporary Japanese setting + touch screen ordering panels + cheap but delicious bowls of squiggly udon almost, NEVER fails. Hana Hana is the new self-serve noodle/udon joint in town, subtly located on Thomas St in Chinatown. Head down here quick before word gets out and it becomes crowded with crazy lines everyday like Mappen. As you walk in, three touch-screen panels greet you in response: you pick what you want and then print the ticket! As this lovely picture indicates, the process is quite systematic and simple! You order through the screen, print your ticket, pick up a tray and plate and then head down to choose your Tempura or Hot Dishes. Cold Dishes, Desserts and Drink options follow before you grab your Main Dish and pay! The Tempura Bar had the usual choices you'd expect such as prawn, fish and chicken, although in this instance I felt that Mappen seemed to have more options. The Cold Dishes were in this cute little fridge and isn't it nice that they have salads and mini bowls of seawood and sashimi? 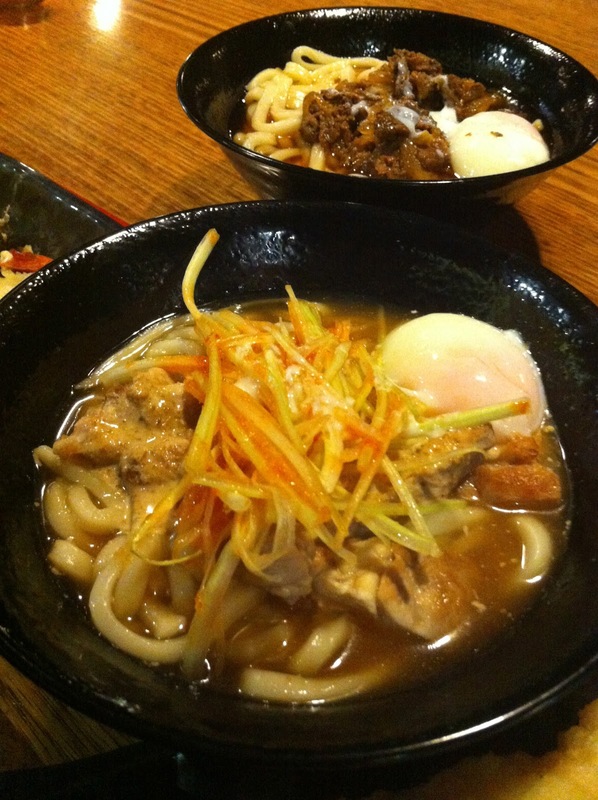 Both M & I opted for an Egg ($1) each because no udon is good without an egg cracked in. A colourful array of cans sit neatly in the open fridge and I must say, they have quite a good selection of drinks there! There is also a water tank beside the fridge, in which you can feel free to help yourself to a cup. 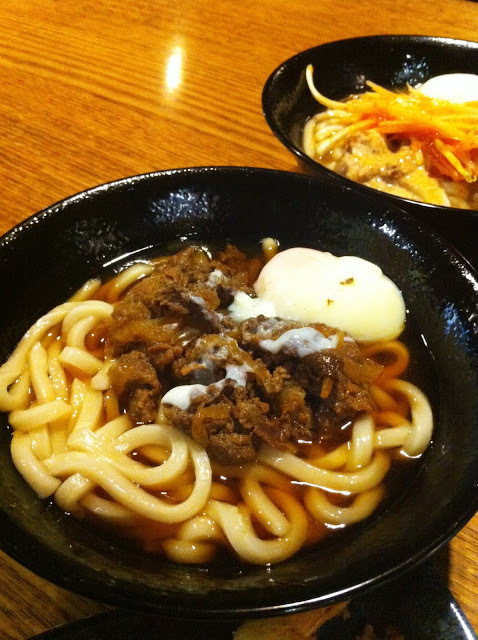 M's Warm Beef Udon ($6.50) were very nice and bouncy with a good chew to each bite. The broth was light yet tasty and the soft gooey boiled egg was just the cherry on top! 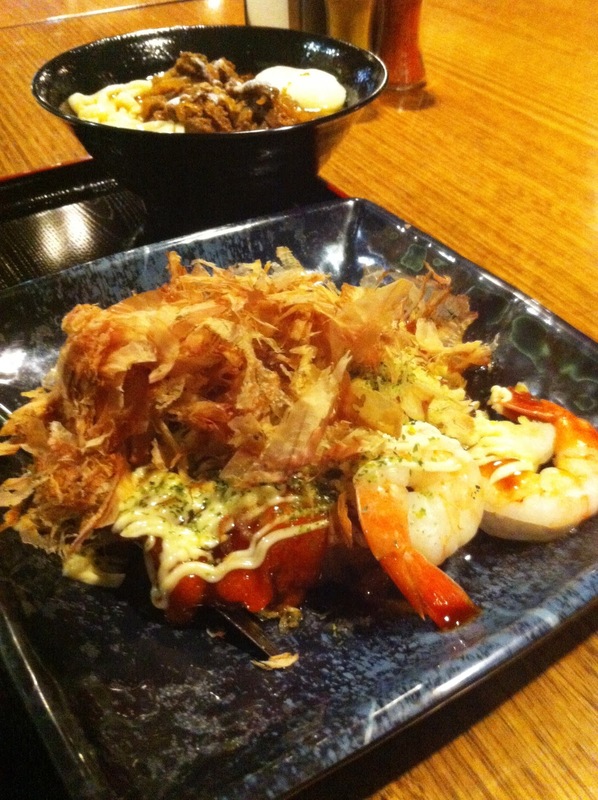 We also ordered the Ebi-Chilli Okonomiyaki ($8.90), which I must say, I wasn't really a big fan of. Then again, I am quite biased as I was never that into Japanese Pancakes so to speak. M loved the dish despite it being so chilli that he had to gulp down two glasses of water post demolition. 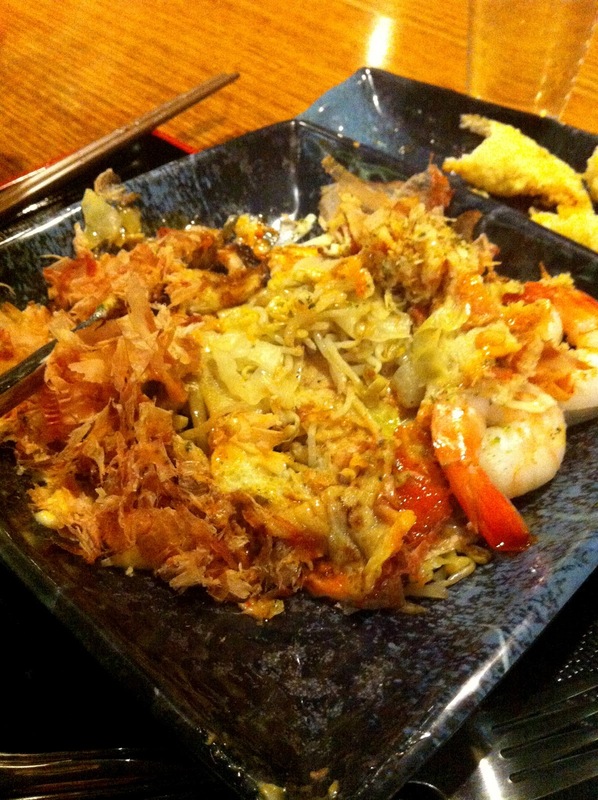 I guess I just felt that there was too much of that Takoyaki sauce and it became really overwhelming for my tastebuds? Regardless, M said he was quite happy with the amount of seafood on the plate and managed to finish most of it all by himself. It would be totally wrong to pass up some fried goodness! 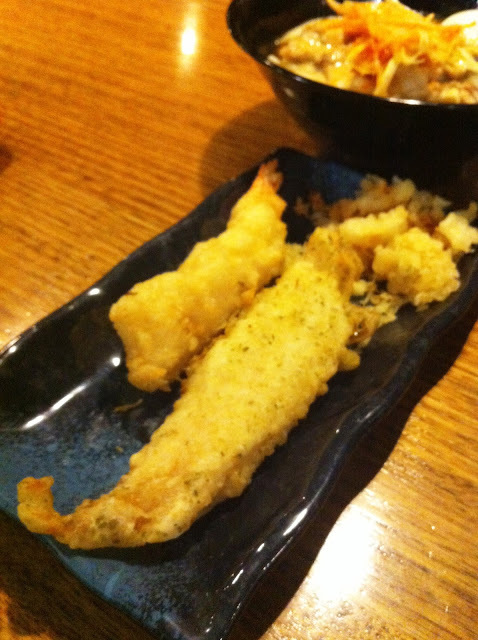 My favourite was definitely the Fish Tempura ($3) but the Ebi Tempura ($3) wasn't too bad either. For a relatively good feast, the bill came to a total of $29.90 for two. Definitely a great place for UNI students to check out - or anyone really, who wants a quick, affordable and delicious meal. As you leave, make sure you take your dirty plates and tray back to the shelf area because then you will receive a loyalty card and stamp. 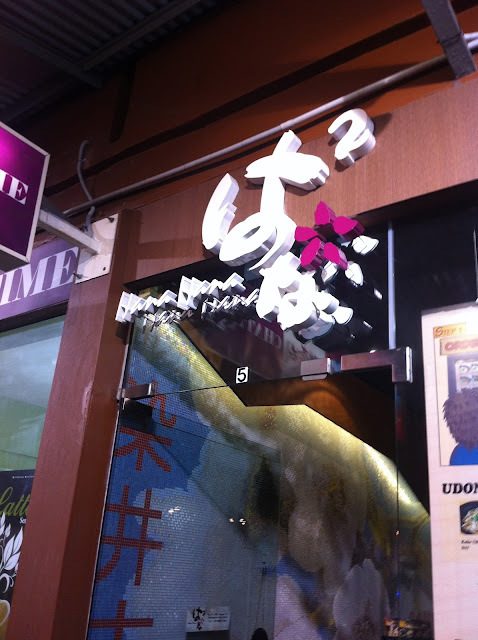 5 stamps=free bowl of udon as I recall!